Why are the noses missing from Egyptian statues? One of the most common questions that I have been asked over the years by community members is: ‘Why are the noses missing from Egyptian statues?’. I learned early on that there is a subtext to this question and that what the person is really asking is: ‘Were the noses deliberately removed in order to disguise the appearance of the people of Ancient Kemet?’. Statues were re-used in antiquity. Temples became obsolete during the later Roman period and onwards, because people changed their religion. When people wanted building materials they would simply take them from the nearest free source. A sort of recycling. There is evidence of this right through until the 20th century. Natural erosion. 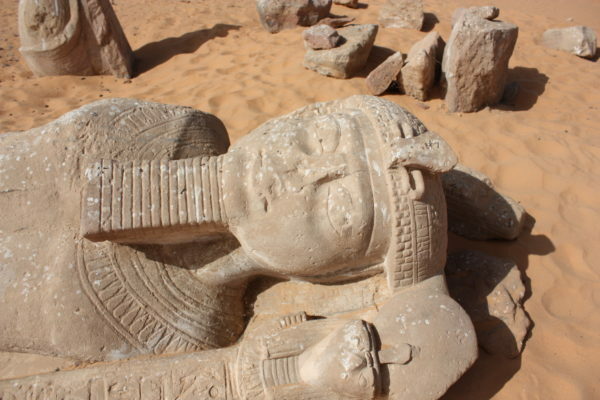 Many statues were made from sandstone or limestone, both of which are soft stones that are liable to erode very easily when exposed to sand or weather conditions. 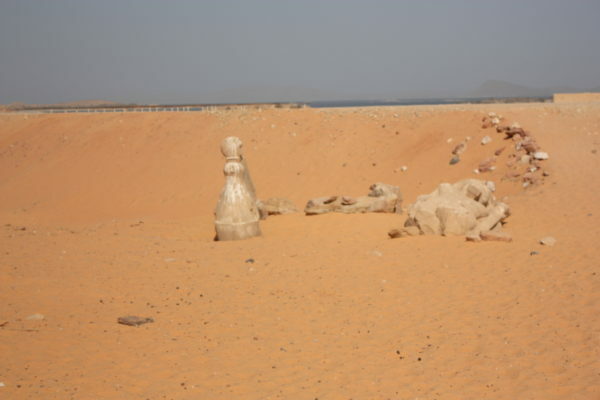 You can see from the above photograph how quickly statues can be covered by sand, and sand erodes (damages) the surface. Hard stones such as granite and basalt survive much better. Coptic (Christian) inscription on an earlier temple relief. The face of the king has been damaged deliberately. Deliberate damage to change the appearance of the statue. Yes this did happen both soon after statues were made, often when a new ruler or dynasty came to power, and also for religious reasons. The images above show a depiction of Rameses II, who ruled Egypt from around 1279-1213 BCE (before common era and so over 3000 years ago). 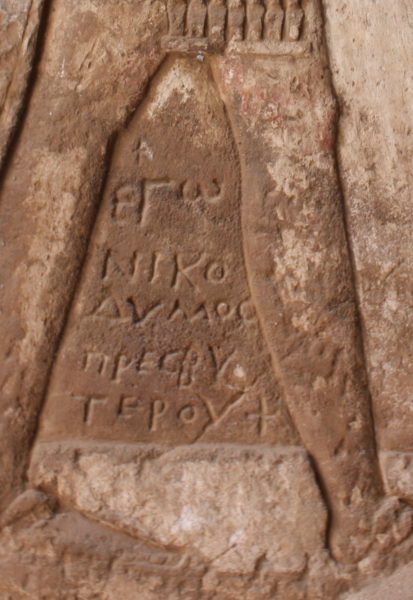 Between the King’s legs is a much later inscription that can be identified culturally as Coptic (Christian) by the cross. The face and eyes of the king have been chiselled away. The appropriation (unauthorized theft) of Ancient Egyptian culture by non-African cultures. 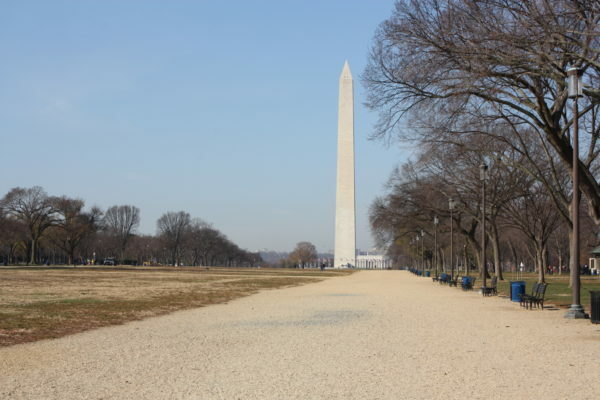 The Washington Monument is in the form of an ancient Egyptian obelisk and was built to commemorate George Washington. More will be written about obelisks in a future post; it is used here to illustrate how easily an Egyptian symbol can be used out of its original context and by a culture that had no direct link to the original. Many cultures that had no connection to Ancient Egypt have used Kemetic symbols for their own purposes, in order to try to connect to a powerful ancient civilisation. How do we know who damaged the noses of statues? For many, we will never know. 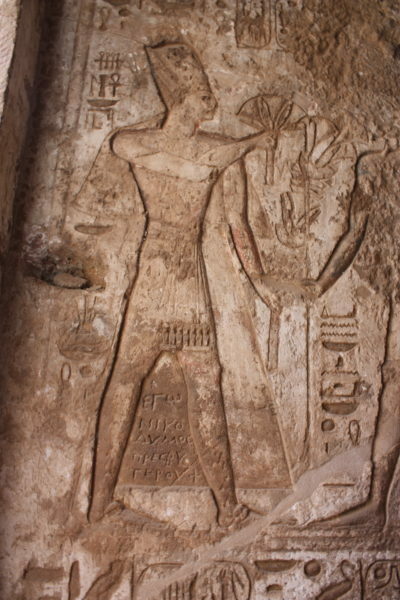 We can assume in the case of the Christian writing next to the damaged representation of Rameses II (above) that the two acts may be related. Still on the subject of appropriation, many people have suggested that non-African cultures have been keen to disguise the African origins of Ancient Egyptian or Kemetic culture in order to claim them as their own. Stories of Napolean’s army firing at the Sphinx in Giza in order to destroy the nose have circulated for a number of years. However, I have been unable to find any documented evidence for this prior to the 20th century; and I have looked in detail. What we do have evidence for, in the form of Arabic manuscripts, is the damage of the face of the sphinx by an 14th century extremist named Mohammed Salim al-Dahr. For further references to the original texts see: Haarmann, U., 1980. Regional sentiment in Medieval Islamic Egypt, in Bulletin of the School of Oriental and African Studies. vol. 43: 55-66. Egyptian statues represented gods, kings, other members of the royal family or officials. When people in Egypt converted to Christianity in the form of the Coptic religion, or later Islam they no longer wished to have what they deemed to be ‘pagan’ images surrounding their new places of worship. 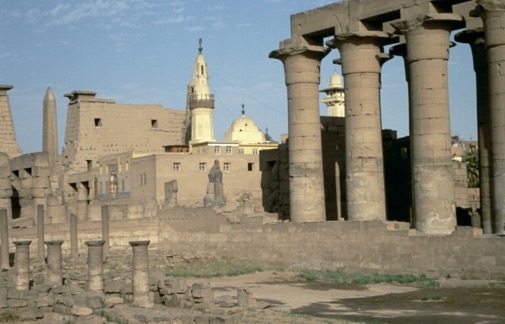 Many of the old temple sites became churches, monasteries and later the sites of mosques, as seen in the image above at Luxor temple. As mentioned above, the new builders often re-used building materials, that to the modern observer contained beautiful images of a past culture, simply as ballast. In short they did not wish to preserve these images, and the available materials saved them time and money. Yes there was, but it was not as simple as damaging the facial features on statues and reliefs to disguise their identity. There was a deliberate attempt by early Egyptologists to deny that Ancient Egypt was an African culture. It was embedded within the discipline from the start and will form the subject of my next post. The Egyptian Arab historian al-Maqrīzī wrote in the 15th century that the nose was actually destroyed by a Sufi Muslim named Muhammad Sa’im al-Dahr. 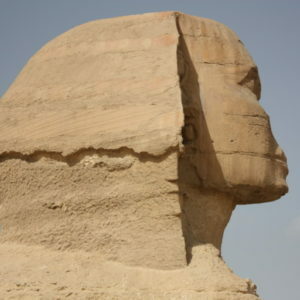 In 1378 CE, Egyptian peasants made offerings to the Great Sphinx in the hope of controlling the flood cycle, which would result in a successful harvest. Outraged by this blatant show of devotion, Sa’im al-Dahr destroyed the nose and was later executed for vandalism. “Erosion” is such an insult to the collectives intelligence its pathetic. Erosion? Really? The end of the post says your next will go into greater detail about the de-Africanization by early Egyptology. I looked and can’t find your follow up! Did you write it or will you write it? I’m very interested! Thank you for your work. One thing we know for sure not one grain of sand was moved by a white/Caucasian man they had absolutely no part in it and they can’t accept that, so they say monsters and super heroes built it . I saw a pic where ankhesenamen‘s nose was totally removed yet her husbands was not? His was obviously African… Strange.. they would remove hers what were they hiding or was it just a slight to her character?? Right on bro these white folks will do anything to distort history they know that black men are the original man and the founders of civilization so to cover this up they chop the nose off the Sphinx to destroy African history. You know these white folks is jealous hearted not all but most and they will go to any length to make they self out to be superior to any other race. No they just stole the ancient artifacts and brought them to their european museums for profit in the guise of scholarship. They were Nubian. Beautiful dark skin and broad festures. They would rather attribute African civilization s to aliens than the people. They knocked off the noses because their pronounced features told you very well, who, they were : Black. “Egyptology” only exist for white people to whitesplain a history that is not their own, and want agency over. Dr. Henri Clark. Search him. Good day. If you read the post, and that following, you will see that I argue for a more engrained conspiracy to whitewash Kemet, based on clear evidence from the early and subsequent academic publications. The ancient people of Kemet were black eons before caucasians ever existed. East africanes dont look like Michael Jordan.what a stupid argument. In Egypt, people are ethnically diverse as they are across the entire continent of Africa. So some people do “look like Michael Jordan.” Take Kenya for example. East African country. Many people have dark skin and wide noses, etc. East Africans don’t all look one way. It’s that diversity that many people fail to acknowledge when looking at the population of Kemet. Within mainstream Egyptology you often find that this is ignored and so the ancient people are not seen to be ‘African’ unless they look a certain way, and when they do then they are labelled as ‘Nubian’. That’s due to race mixing, white people breed with a race and take its culture . Creating a race von mixed origin then stating there claim that black people could not have created this wonderful civilization. The great lies they tell. The second part of this post: http://kemetexpert.com/egypt-versus-kemet-a-case-of-cognitive-dissonance/ gives an overview of the long history of non-African presence in what we now call Egypt. The largest non-indigenous migration/settlement was not European, but from what we now call the Middle East and later Turkey. This makes the case for European ‘ownership’ even weaker, but it also presents another layer of non-indigenous peoples in this region. It depends on what time. You’re looking at, 7000 years ago most of the people in that region looked the same, let me just cut to the chase these noses were deliberately broken out the statues to hide the African ethnic appearance of the Pharaohs and many important figures in kemetic history. It’s a fact that racist Europeans and racist Arabs wanted to hide the true identity of the ancient African kemetic people of the Nile Valley. Don’t stick your head in the sand and try to ignore that. Hi Ron, can you provide credible sources to your assertion that “It’s a fact that racist Europeans and racist Arabs wanted to hide the true identity of the ancient African kemetic people of the Nile Valley.” ? Yes the Arab invasion of Egypt, AJ Butler. You are so right! Anything that can be hidden or lied about involving African American People has been done forever! If you think this is BS watch Hidden Figures. Now where is that story in the so called History books?? Ron …you are 110% right! I am not attempting to reply to anyone, as I do agree with the obvious fact that statues were definitely defaced for racist reasons, I have believed for many years that the people of Egypt did construct all of Egypt…The questions have become How and with what technologies…That still today have not been mastered, meaning angles, huge stones weighing many tons, even knowing the entire reason why they were pyramid structures built all over the Earth…Moreover, How was gold used in pyramids? How was the Nile River used, what chemicals are found under the great pyramids? What are substsance used to line areas of the pyramids….Its to to turn the discussions from whay race did what to who ever had the knowledge to construct these structures,where ever, they came from…The fact that beings of color resonate to the Earth and beyond is becoming difficult to conceal…as the knowledge base increases exponentially,Race is but a distraction from truth….It is time for a mentality inclusion for their is truth to be discovered by unvarnished scientific revelations!!! The continent of Africa is very large with many different ethnic groups and they come in all sizes, complexion and shapes. The problem is too many in the Western world do not want to except that .Do you really believe that all the peoples in Africa have a wide noses? The issue is that Egypt is rarely presented as an indigenous African culture by museums, educators or the media. It doesn’t help when highly respected scholars like Henry Louis Gates come along and deny AE they’re Africaness based on the fact he feels some of the artwork doesn’t fit his idea of what Africans should look like – I believe he made a comparison to them not looking like Michael Jordan. I haven’t yet seen this series, but have heard a lot of (not so positive) feedback. That’s a great pity if he isn’t recognising diversity amongst African peoples. People have to be insane not to see these statues all have a nose that is wide not narrow and facial features of Africans. People please wdfu!!!!!! Hi thanks so much. How do I contact you. Would love to use some of the info on your blog on my book. Thank you Alexander. It’s such a pity when Kemet plays such a strong existing role in many educational systems that it isn’t fully acknowledged as African. No, it was damaged long before then. And since there is a general and firm denial that these representations are of people of African heritage, and they were viewed by collectors and museums as European it wasn’t really in their interests to damage the pieces. CULTURE, I believe in him First And He is Blind , all his Life and knows Then The Best. PEACE!!!! People may also wish to consult the work of Professor Asa Hilliard. This is where I found my first knowledge on who damaged the noses of statues. However it is interesting to learn from the blog “Why are the noses missing from Egyptian Statues?” that there are quite a few other relevant reasons too! Thanks so much for sharing your information Patricia, it’s great to have a reference to the story of Napoleon’s army damaging the features of the Sphinx at Giza. I would be really interested if other people have books that refer to this. We know from drawings that people made at the time that the face was already damaged. However, what these stories and explanations show is how people of African descent seem to have inherently known that others were trying to remove ancient Egyptian culture from being a part of African history. What I will be writing about in my next post shows that this was the case, but that it is far more deeply engrained in the history of Egyptology as an academic discipline.